LA Performance Services, who promote events at Shakespeare County Raceway, have announced that Gold RV are to sponsor the left lane at Shakespeare County Raceway. The minimum two-year deal starts at the Power Nationals on 1st-2nd April. Gold RV are one of the UK's leading companies for RV sales, service and spares. They are sole UK agents for the Canadian Triple E range of motorhomes and authorised dealers for Roadtrek and Pleasureway Class B motor homes and Viking Hard Top Folding Campers. Gold RV also carry a large stock of used Canadian and American motorhomes covering all price ranges and specialise in matching RVs to customers' specific requirements. Managing Director Derek Flynn races in Super Pro ET himself and fields a Junior Modified Dragster driven by Arlo Reddick as well as sponsoring other teams. "It started when Lee used a picture of my dragster to promote the Power Nationals", said Derek Flynn. "We already have advertising boards at Santa Pod and when I spoke to Lee about advertising at Shakespeare County Raceway he said that a lane sponsorship was available. I thought it would be neat to have a lane of my own - when I get lane choice and my opponent asks me which lane I want I'll say "My one"!" 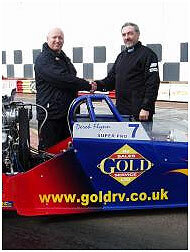 "I am very proud to have Gold RV involved at Shakespeare County Raceway because of their association with drag racing through track and team sponsorships", said Lee Child who jointly sponsors Eurodragster.com's Links pages through LA Racing Parts. "The Gold RV Racing Super Pro ET and Junior Dragster teams are always professionally turned out and when I visited Gold RV and Derek gave me the tour I was not surprised to find this professionalism reflected in the facility, vehicles and services which Gold RV offer." Derek told Eurodragster.com that his existing involvement in drag racing has already led to a number of motorhome and spares sales and that he is very pleased with the exposure Gold RV receives. "The commentators at both tracks do a great job of crediting sponsors and the Gold RV lane will increase our exposure still further", he said. "Drag racers have already proved to be some of our better customers and so we are very proud to support UK drag racing further by sponsoring the Gold RV lane at Shakespeare County Raceway." You can find out more about Gold RV's services on their web site at www.goldrv.co.uk, and you can stay in touch with all the latest from the Gold RV Racing team on their web site at www.goldrvracing.co.uk.